Since the EU Referendum, the courts have been called upon time and again to make politically charged judgments to break the constitutional impasse. They have been branded ‘Enemies of the People’ and fêted as defenders of centuries-old constitutional principles in equal measure. 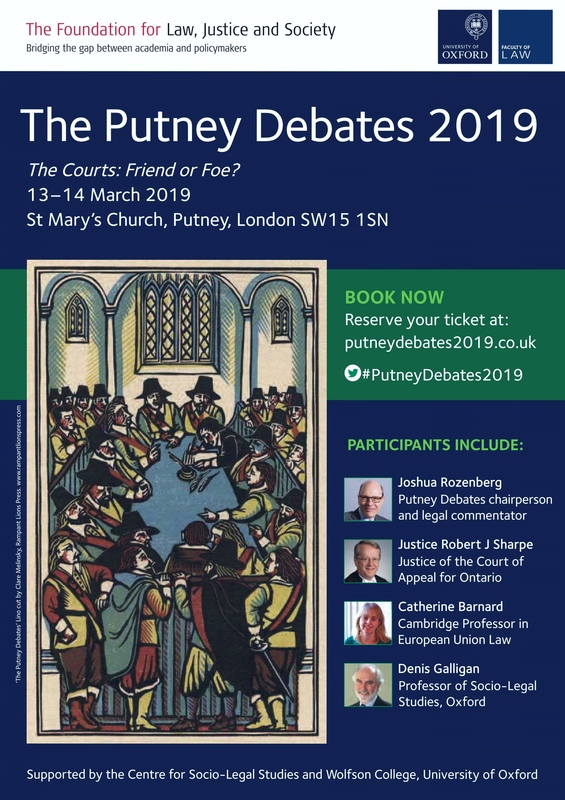 Full details and registration at: www.PutneyDebates2019.co.uk. A flyer for the event can be found below . Between 7 and 13 July 2019, in Lucerne (Switzerland), upon the occasion of the IVR Conference 2019, we are organizing a special workshop on ‘Constitutionalism and Disagreement’. The workshop will examine the way in which liberal constitutionalism deals with disagreement as well as addressing normative questions about how contemporary challenges ought to be met. Do we need to modify the traditional virtues of toleration and civility? Are the accounts of public reason-giving found in theories of deliberative democracy adequate to cope with the demands of the current moment? If not, with what do they need to be supplemented? Might some of the current attacks on the liberal order possess the potential to open up possibilities that had been foreclosed by liberal conceptions of constitutionalism? These and related questions will be addressed from perspectives drawn from political, legal and moral theory (for a more detailed description of the workshop, please see HERE). This call for papers intends to select one or two papers for the workshop. Submissions are particularly encouraged from early career academics (especially women). We kindly ask interested participants to submit an abstract (around 300-500 words) as well as the provisional title of the presentation, to f.oliveiradesousa@maastrichtuniversity.nl or a.g.latham@swansea.ac.uk, until March 1st. We are happy to clarify any further information you might have in relation to the workshop by email. Please circulate to whomever you think might be interested. Liberal constitutionalism is traditionally associated with limitations to majoritarian power. Put in J.S. Mill’s wording, “the people … may desire to oppress a part of their number; and precautions are as much needed against this as against any other abuse of power”. Constitutions are, under this view, the foremost example of such precautions. Yet, as powerful as this conception has been in shaping scholarship, constitutional practices and institutional arrangements, it has met with opposition from sundry perspectives, under different labels. Some speak of popular, others of political constitutionalism. Moreover, recent developments in democratic theory show an increasing interest in deliberative constitutionalism. Finally, we are currently witnessing the rise of illiberal or populist forms of constitutionalism. It is presently not clear, however, if scholars championing these alternatives are talking with each other or past each other. With this in the background, this workshop seeks to answer some of the following questions: what are the differences, if any, among these alternatives to traditional accounts of constitutionalism? Are they conceptual in nature, or normative? Do they endorse different principles? To the extent that they do, are they compatible to each other? How? Do they justify different institutional arrangements? If so, which? We welcome abstracts of papers answering these and other related questions. We will also invite participants to contribute with their presented papers to an edited book we aim to publish after the workshop. 1. Abstracts of up to 300 words and a CV should be submitted to both convenors by February 15th, 2019. Email them to: a.cannilla@reading.ac.uk and donaldemerson.bellohutt@kuleuven.be. 2. Full versions of accepted papers should be submitted to the convenors by May 31st, 2019. This entry was posted on February 1, 2019 by Constitutional Law Group in Events.